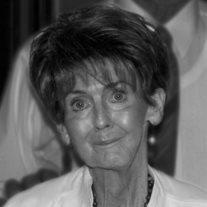 Sharon Dian Merrill Nance passed away quietly on January 23, 2014 in Mesa, AZ. She was born in Mesa, AZ on May 25, 1939 to Virgil Merrill, who was one of the Valley’s largest citrus growers, and Evelyn McIntyre Merrill. In 1957, she married the love of her life, Charles Nance. They enjoyed 56 years together; raising a family, traveling, and sharing a life-long passion for collecting antiques. Sharon was strong in faith and spirit. She enjoyed spending time with her family, scrapbooking, reading, and completing crossword puzzles. Sharon is preceded in death by her pioneer ancestors who helped settle Lehi and Mesa, her father Virgil Merrill, her mother Evelyn Merrill, her step-mother Frances Hollingsworth Merrill, two grandchildren, Jacob Brinton and Joshua Brinton, and one great-grandchild, Gavin Sprague. She is survived by her husband Charles, her three children: Stacy Allen (Wyatt), Shelley Brinton, and Scott Nance (Kris), ten grandchildren: Chad Allen, Kasey Allen, Jake Allen, Bethany Sprague, McIntyre Brinton, Vanessa Chaffee, Jessica Curtis, Natalie Brady, Emily Nance, Savannah Nance, and 21 great-grandchildren: Joenick Shipley, Jaxon Chaffee, Evienne Shipley, Jaden Allen, Lily Chaffee, Ema Allen, Austin Allen, Deacon Allen, Annabelle Curtis, Edison Chaffee, Jordan Allen, Leighton Allen, Olivia Sprague, Beckett Chaffee, Chad Curtis, Jr., Juliette Curtis, Dean Brady, Tristan Allen, Truman Brady, Ruby Chaffee, Bowen Curtis, and six siblings: Virgie Maughan, Richard Merrill, Rebecca McMeen, Rex Merrill, Rhonda Lopez, and Robert Merrill. Graveside services are Saturday, February 1, 2014 at 11 AM at Mesa City Cemetery, preceded by a visitation at 9:30 AM at Bunker’s Garden Chapel, 33 N. Centennial Way in Mesa.